Andreas Dimitriou (left) and Michalis Karaolis. 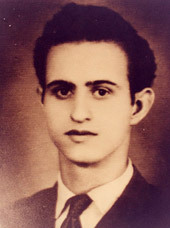 Michalis Karaolis murdered a local constable; Andreas Dimitriou (or Demetriou) hadn’t managed to kill his target, and only injured the British intelligence agent he shot. This, however, occurred two days after the enactment of draconian emergency regulations to counteract EOKA terrorism, under which merely possessing a firearm could be a hanging offense, never mind discharging it into someone. The two of them weren’t connected to one another save in their common support for expelling the British from the Mediterranean island and reuniting it to the Greek mainland. It was a longtime, long-frustrated Hellenic dream. 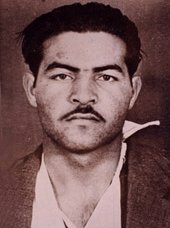 Great Britain, even while the death penalty was eroding domestically, spurned international appeals for clemency — the Greek government made history by filing the first state-vs.-state petition to the European Commission of Human Rights a few days before the execution — reckoning that its credibility as a hard line against terrorism was at stake. In Nicosia, where the hangings took place, schools were shuttered, armed paratroopers patrolled streets barred to traffic, and newspapers operated under a censor’s requirement not to inflame the populace. In Athens, beyond the reach of the crown, the soundness of this policy was unpleasantly confirmed. Seven deaths and hundreds of injuries resulted from the ensuing brickbats with police. (The mayor of Athens personally smashed up a tributary plaque to Queen Elizabeth II.) 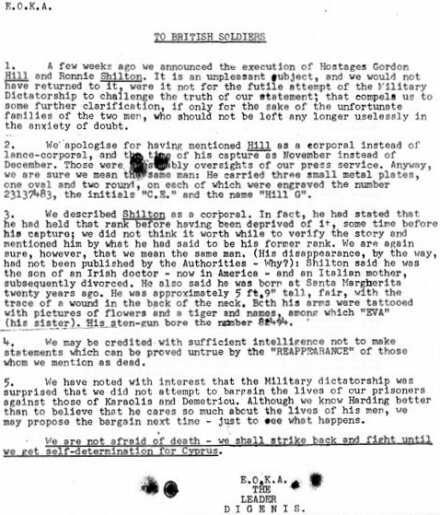 And in retaliation, the EOKA subsequently executed two British soldiers it had captured, Gordon Hill and Ronnie Shilton … although British skepticism over this claim required an additional statement clarifying the matter. How many innocent people were executed? How accurate British Intelligent information about EOKA? How many innocent Cyprus citizens got to undergo the turmoil? IT WAS MIDNIGHT EARLY MORNING ON THE FIRST APRIL 1955 WHEN I HEARD A BOMB EXPLODING IN LIMASSOL . I WAS ASKED A MONTH EARLIER TO BECOME A MEMBER OF THE EOKA AND WHEN I WAS TOLD THAT BY JOINING IF I WAS COMMANDED TO KILL I HAVE TO OBEY ORDERS I REFUSED . I LOVED MY COUNTRY BUT I WAS NOT GOING TO KILL FOR ANY REASON . I EVEN HAD A YOUNG SOLDIER FROM ENGLAND DOING HIS SERVICE IN POLEMEDIA . HIS NAME WAS WILLIAM AS MY FRIEND . ON THE 10TH OF MAY 1956 ASCENCION DAY I WAS AS A STUDENT IN ATHENS AND I TOOK PART IN THE DEMOSTRATION AGAINST THE EXECUTION OF CARAOLI & DEMETRIOU . WE STARTED FROM OMONIA SQUARE WHERE THE ARTCHBISHOP GAVE A SPEACH BUT WE NEVER REACHED CONSTITUTION SQUARE .I WAS NEVER ON THE FRONT LINE AS I WAS A DEMOSTRATOR OF PEACE . NOW AT 77 I DO NOT WNOW HOW TO USE A GUN BUT I BELIEVE IN PEACEFUL RESOLUTIONS OF CONFLICTS . I PRAY TO GOD THAT I DO NOT HAVE TO EVER LIVE A WAR SITUATION . AMEN.